When recording stock transactions, it’s vital to include as much information as you can so that the Livestock Rec. can provide you with accurate information about what stock is on hand, and what stock numbers are required on a month by month basis to optimise productivity and achieve business goals. Is it a birth, sale/purchase, or death/missing? If it is a cash event, what is the sale or purchase date? Should the stock class be recorded as a Ewe Hogget or Two Tooth? Are you recording carcass or live-weight? It’s important to remember that your animals will age up to the next stock class at the end of your financial year. This means that, to ensure you have accurate tallies in your Livestock Rec, you must code any stock transactions back to the stock class they opened as at the beginning of the year. Tip: If you don’t want stock to age at the end of your financial year, you can turn off the automatic age setting and do it manually. A)	Double click or right click on the grid point cell for the required stock class and transaction month. B)	Click on New Other from the toolbar. You will be prompted to select the type of transaction you wish to enter and once the worksheet, located in the Worksheet Item tab, has turned blue it means the worksheet is in edit mode for you to enter the transaction detail. While some actual stock information can be edited in the Livestock screen, such as quantity, weight and stock class, we recommend you go back to the best source of truth, the bank transaction within the Transaction screen. Tip: You can quickly and easily locate stock transactions while in the Transaction screen by using the Filter button in the toolbar . Click Filter Clear from the toolbar to revert back to your original view. For more information on editing transactions in the Transaction screen, click here. 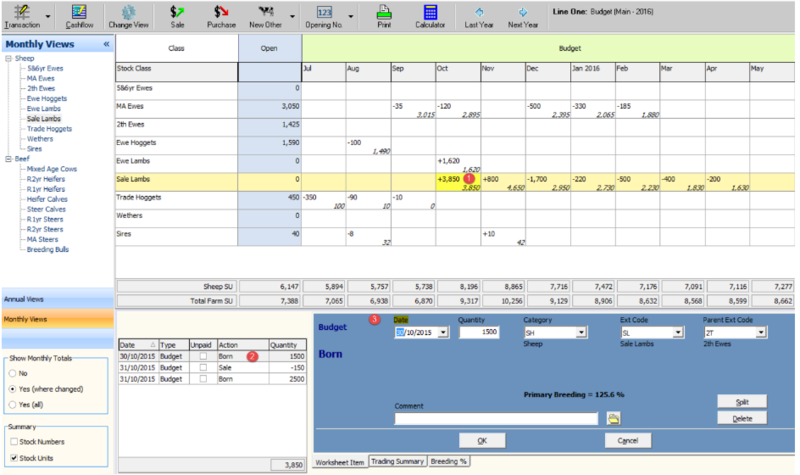 Identify the stock class and transaction month for the event you wish to view or edit. If you wish to view or edit the record, double click on the grid point (called a cell) for the required stock class and transaction month. This will put the bottom panel for the monthly view into edit mode for update. If there are multiple events, select the correct record from the worksheet list that is to the left of the edit panel. Tip: To edit a stock transaction, double click on the event in the worksheet list or highlight the transaction in the list and double click on the transaction in the Worksheet Item tab. Edit details in the transaction and click OK to save the changes.